Get Gorgeous Hair This Fall! It can be difficult to keep hair soft and shiny during the colder months. It is important to use the right products to manage dry hair and keep it looking great! 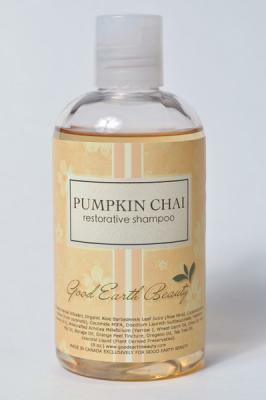 Shampoo Pumpkin Chai Restorative ($15 USD 8 oz) — A Good Earth Beauty Exclusive! A moisturizing, restorative shampoo scented like pumpkin with a hint of spice. Warm, cozy and delightful. A perfect marriage of fresh pumpkin with creamy, milky chai. What I think: This smells delicious! My daughters and I are really enjoying the scent of this and the matching conditioner. Not only does it smell amazing (and the hair keeps the scent all day), it leaves my hair clean and soft! 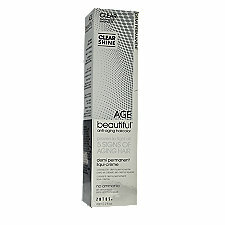 Zotos AGEbeautiful Anti-Aging Demi Permanent Liqui-Creme Haircolor Clear ($5.99 USD) –a colorless demi-permanent shine glaze that adds a brilliant glossiness, amplifies smoothness, and improves hair’s manageability. What I think: This is a great product to add shine back into the hair! It’s easy to use and leaves hair soft and shiny without changing the color. Maijan Moroccan Argan Oil Leave-In Hair Serum ($49.95 on sale for $25 USD, 3.4 fl oz) — Maijan Moroccan Argan Oil Leave-In Hair Serum with Grapeseed Oil and Essential Oils is a leave-in hair serum which naturally infuses you hair with Omega-6, antioxidants, and Vitamin E. Your hair instantly absorbs the serum resulting in incredible shine, softness, bounce, and UV protection. This amazing serum instantly eliminates frizz! That is amazing. What I think: This is a great everyday serum. I put it in my hair washing while it is still damp and it helps keep away the frizzies and leaves my hair soft and shiny. It is a light, non-greasy oil. And it has a fresh, herbal scent. Cricket Amped Up Tease Brush Fushia ($4.29, $2.69 on sale now) — A Cricket Amped Up Tease Brush works great to increase volume on all hair types. Great for updo styling and increasing volume on all hair types. Boar. 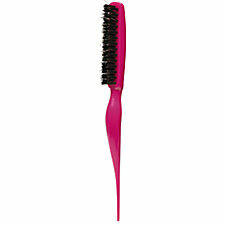 Nylon mixed multi-level bristles enable you to create various degrees of volume and style easily. 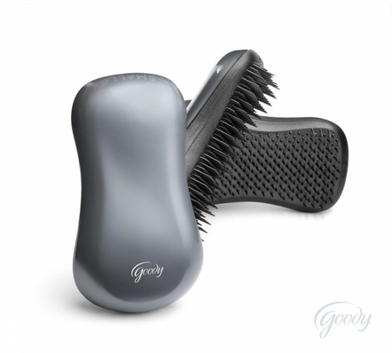 A unique bristle pattern and texture minimizes damage, breakage, frizz and split ends. Hair is left smooth and shiny. An ergonomic handle provides maximum comfort as well as being heat and chemical resistant. Specially designed sectioning tip allows for separation and texture variation. What I think: I don’t usually tease my hair, but I really like this brush. It teases well, or you can use it as a detangler. Very affordable! Mixed Chicks Spring Bands ($3 USD) — Mixed Chicks introduces their very own tangle-free spring bands that are perfect for all types of hair; never pulling out any strands and leaving hair kink/tangle-free. No more worrying about damaging your locks with extra tight constraints. Go from updos to loose, flowy locks without dents or lumps using these new spring bands! Whether you have straight, natural, or super curly tresses, the hair ties will slip out effortlessly without damaging or breaking your hair. Easy to put in or take out, these spring bands are great for gym workouts, quick errands or evening outings. Color coordinate your favorite look with any one of the spring bands and be a trendsetter with this stylish new hair product. What I think: These work very well in all types of hair. I have wavy hair, but I know that they will work well in curly hair, too. They are available in Clear Light Yellow, Clear Light Pink, Clear Aqua Blue, Clear Amber, and Clear Black. When the weather gets colder, it is so important to really take care of the skin before it becomes dry and dull. There aer so many different types of products that you can use to help the skin glow. I have been sent the products below to review for my honest opinion. These products run the gamut from cleansers, moisturizers, eye gels, masks and even a collagen drink. Use one or combine them for perfect, glowing skin! Intraceuticals Opulence Brightening Cleanser ($49 1.69 fl. oz. USD) A gently foaming cleanser to thoroughly cleanse, lift away impurities and leave skin soft, clean and bright. What I think: This cleanser is very gentle on the skin. Lots of cleansers leave my sensitive skin red, but this does not. It also doesn’t dry my skin out after use. Amarte Wonder Cream ($79 2.7 fl. oz) — A refined skin treatment used to restore and nourish precious, delicate skin. Retinol and nutrient-rich, the advanced Korean formula therapeutically and gently diminishes freckles and sunspots, reduces lines and wrinkles and lovingly exfoliates for a supple, translucent complexion. Formulated with unique ingredients like caviar extract, pearl powder, and mushroom emollient, Wonder Cream revitalizes the skin with minerals and protects against external factors such as UV rays, irritation, and environmental toxins. What I think: I like to use this moisturizer at night after a serum. It is a great overnight treatment. It can also be used in the day time before SPF. This is very gentle on the skin and really makes skin look bright. Combines broad spectrum sunscreen with Super Hyaluronic Acid™ to replenish moisture and protect skin against the harmful effects of sun exposure. Helps strengthen skin’s resistance to signs of premature aging. Gentle formula leaves skin feeling comfortable, smooth and protected. What I think: This is an excellent day moisturizer. It has sunscreen built in, eliminating a step in your skin care routine. Asian skincare is hot right now, and this one is very affordable! Intraceuticals Rejuvenate Contour Eye Gel ($125 USD) An ultra concentrated gel hydrator with double the concentration of hyaluronic acid, specifically formulated for the delicate eye area. Ultimate hydration and visibly reduces the appearance of fine lines, wrinkles, puffiness and dark circles. What I think: I usually use eye creams, so this gel is a nice change of pace. It instantly cools and hydrates my eye area. 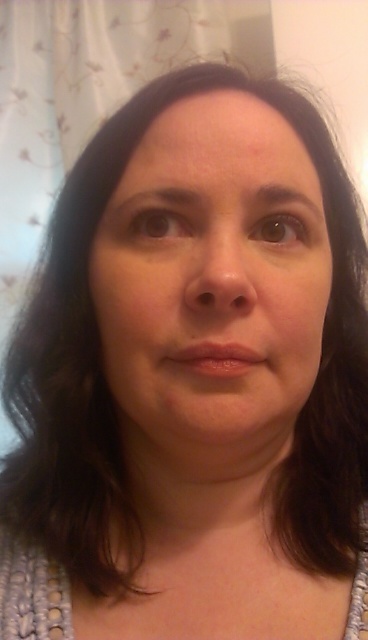 After use for a few days, I noticed that the skin under my eyes looked smoother and a lot less puffy. I am hoping with use over time, it will help with my dark circles. 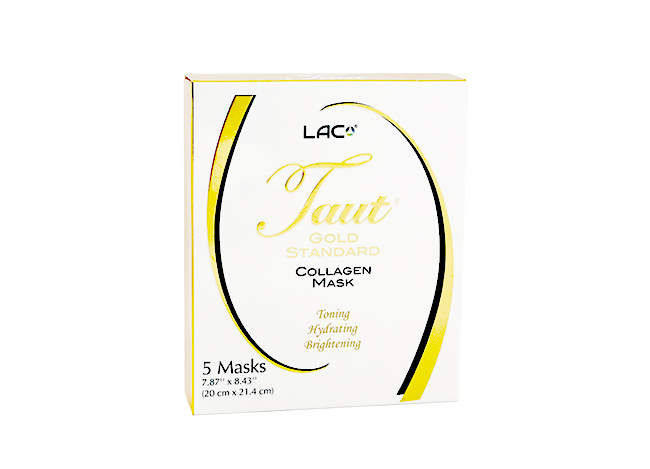 Taut Collagen Mask ($50 for 5 masks) — LAC Taut Collagen Mask is a luxurious, high-intensity facial mask that helps revitalize skin. Achieving a smooth, moist and radiant complexion has never been easier. Manufactured in Japan, this mask is specifically formulated to target sagging, dehydrated and dull-looking skin. With a unique blend of hydrolyzed collagen, squalene, hyaluronic acid and antioxidants, this intensive mask penetrates deeply into the skin to tone, hydrate and brighten the complexion. What I think: This is a very hydrating mask. I put it on a day that I wasn’t wearing makeup and it left my skin soft, but a little sticky at first. It took about an hour for the serum on the mask to really sink in. I suggest use at night. Available for purchase at www.renewalliance.com/store. 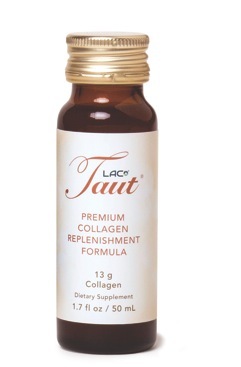 Taut Premium Collagen Replenishment Formula ($110 for 8 bottles) –Unique and powerful liquid collagen beauty formula from Japan to improve skin elasticity, firmness and hydration. Each 1.7 fl oz contains the highest concentration – 13 grams – RDS* (Rapid Delivery System) premium Type(I) hydrolyzed marine collagen infused with anti-aging ingredients to restore your skin’s natural radiance and help reduce the signs of aging. What I think: I have recently taken my first bottle of this. I took it at night and have been directed to take one a night for 8 nights. The taste is a pleasant orange flavor. If I do see results from this in a few weeks, I will report back. This is also supposed to help with health and growth of hair and nails! I am definitely a bath person. I know that showers are faster, but I love long, hot bath. It totally relaxes me. Are you a bath or shower person? Leave a comment and let me know, and know what your favorite bath or shower products are! Laura Mercier Honey Bath ($40 USD) — This decadent, foaming honey moisture body bath leaves skin feeling clean, fresh and supple. Available in five delectable fragrances: Almond Coconut Milk, Crème Brûlée, Ambre Vanillé, Crème de Pistache and Fresh Fig. What I think: I have this in Fresh Fig. It smells fantastic and gives lots of foamy bubbles. And the jar is so cute! This is well worth the splurge. I want to try all of the scents. 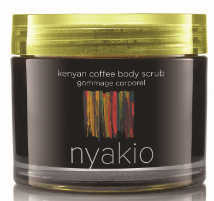 Nyakio Kenyan Coffee Body Scrub ($55 USD) — This scrub blends naturally energizing and exfoliating Kenyan Coffee with Sugar to remove dull skin while providing antioxidant benefits. With Mongongo Nut Oil, Shea Butter, Jojoba Oil, Grape Seed Oil and Avocado Oil, this unique fusion leaves all skin moisturized, smooth and soft. What I think: This is a wonderful scrub! I used it on the back of one hand and had to do the other right away to make them even — the first one was visibly smoother! And the scent is vaguely coffee-ish, but it’s not too strong. H2O Plus Spa Sea Lotus Body Wash ($17 USD) — This exhilarating body wash renews the skin and deeply nourishes with essential vitamins and minerals. Sea sourced water lotus and bamboo extract provide long-term moisture and stimulate the regeneration of healthy skin while mineral-rich brown and red algae blend are combined with aloe and vitamin E to soothe and nourish the skin. Skin is left lightly scented with the refreshing aquatic floral scent. Try it in a morning shower for an invigorating awakening. What I think: I love H2O+’s scents — and this new sea lotus fragrance is no exception. It is a great spa scent, with a little bit of floral scent added. It also comes in a body scrub ($20 SUD) and a lotion ($21 USD) so you can layer the scent. 1) Yikes! — Waxing at a salon is ridiculously expensive, costing anywhere from $45 – $100 per leg. Not to mention that doesn’t even cover the bikini area, armpits and other body parts we don’t want to share with our hair!! Oh, and home waxing kits? We won’t even go there! 2) Ouch! — Waxing hurts like heck! Having scorching hot wax dripped on your skin to later be yanked out by the roots isn’t an ideal spa day experience. Imagine the ensuing pain that comes with ripping a bandage off… now multiply that by at least 5. 3) Yuck! — While getting a full leg or armpit wax removes unwanted hair, it often results in bumps, ingrown hairs, rashes, and even pimples. Have sensitive skin? The hot wax can cause unwanted irritation that will leave you with legs you’ll cover up instead of show off. 4) Nasty! — No one knows how sanitary the salon wax actually is (or the actual salon for that matter!). With waxing, there is always risk of a bacterial infection, skin infection, or even a disease since it strips away the body’s natural protective layer that prevents bacteria from penetrating the skin. 5) Dang it! — Last minute beach trip or spontaneous first date will never fly since you need at least 3-4 weeks of hair growth for the wax to adhere. So if you have last minute plans, you’d be out of luck! 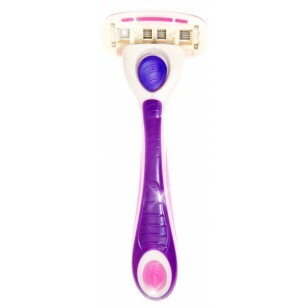 What I think: I have tested their 5-Blade Women’s Razor. This is a great razor! It has a lubricating strip all around and a soapbar at the bottom. The 5 blades gives a very smooth shave and it is easy to change the heads. Learn more and purchase at www.800razors.com. In the 1980s Sure Anti-perspirant/Deodorant ran one of the most memorable advertising campaigns with the slogan, “Raise your hand if you’re Sure.” Today, the brand is offering women even more confidence to go about their day. They recently revealed a new look and introduced two new conditioning solids –Vitamin Infusion and Pure Essence. The new conditioning solids offer a pH-balanced invisible formula that provides lasting odor and wetness protection while working to reduce irritation and smooth rough patches. The unscented Vitamin Infusion formula conditions and repairs skin with Vitamins A and E, while the Pure Essence variety features a light fragrance and soothing aloe extracts. 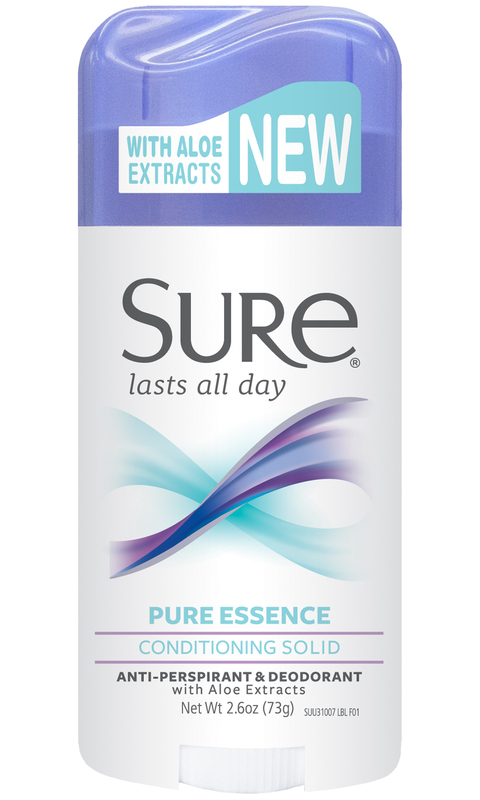 Sure products are available nationwide at major drug stores and retail for around $2.99 each. Available varieties include Unscented, Regular Scent, Fresh Scent, Powder Scent, Vitamin Infusion and Pure Essence. What I think: I have been given the new scents, Vitamin Infusion and Pure Essence. I really like the soft scent of Pure Essence. I use a stronger deodorant, but I gave these to my teenage daughters and they love them! They keep them dry all day. performance of skin’s own moisture barrier. What I think — this is so moisturizing on my dry, fall skin! My legs have been so dry since the weather turned cold. This keeps them soft all day long! Do you live a busy, stressed life? I do! I was sent some samples of UrgentRX medications powders for my honest review. 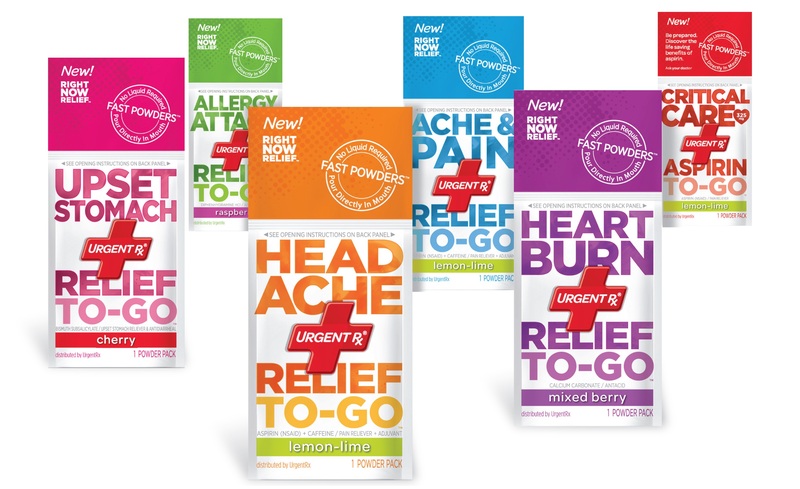 They combat your pain symptoms without needing water and come in thin single serving packets, so they are super easy to use. UrgentRx ® Fast Powders ™ Credit card-sized packets of fast-acting medication. No Water. No Waiting. Just Right-Now Relief. Just rip open the credit card sized package, pour the flavored powder medications directly in your mouth and stand by for record time relief. No matter your symptom (headache, heartburn, allergy attacks, pain & aches and upset stomachs), we are here! What I think: I tried the headache, heart burn and ache & pain medications. They tasted okay for medicine. They left an aftertaste so I had to use water to get the taste out of my mouth. But they worked fairly fast, maybe in 10-20 minutes I started feeling better. I like that they are easy to carry in my purse and that they did work quickly! Right now, you can get a 12 pack of each one on Amazon for $13.99. Whether you’re looking for insoles for your favorite heels or flats, or anti-friction products to help prevent shoe rubbing and blisters, the Dr. Scholl’s® For Her line has a solution for you. The entire collection enables you to enjoy the things you want to do – not just the things you need to do – by enhancing foot comfort. Dr. Scholl’s® For Her High Heel Insoles are clinically proven to help prevent foot pain caused by wearing high heels 2” or higher. They offer immediate, long-lasting comfort and an ultra-soft gel arch to shift pressure off the ball of your foot. They’re proven to improve the way you feel in heels! Although I don’t wear high heels everyday, I am excited to use these in my fall high heel boots. They are so much more comfortable with the insoles and I will be able to wear them longer! I received this product complimentary for testing and review purposes from Influenster. Influenster is a great site where you can receive great products to test and review. Let me know if you would like to join in the comments with your email address and I will send you an invite! To achieve this wavy look, I let my hair air dry, brushing it with the Tangle Fix every so often to smooth it down. I dried smooth and wavy and very pretty with the help of the Tangle Fix!